Included in this expansion are six standard sized scenarios that focus on key phases of the battle of Austerlitz, 2 December 1805. This expansion also features 12 EPIC sized engagements and two La Grande Battle scenarios. Also included are two double-sided mounted maps. The EPIC sided battlefield is larger, and at 11 hexes deep by 20 hexes wide, it is almost double the size of the standard size battlefield of 9 hexes deep by 13 hexes wide. When laid side-by-side to form the La Grande battlefield, the battle area is a whopping 11 hexes deep by 26 hexes wide. Knowing that it is not always easy to muster eight players, the EPIC Napoleonic game is set up to play very well by just two players. Or if players so desire, the EPIC game, can in fact, be expanded to include four and even six players. In an EPIC Napoleonics game, one player on each side assumes the role of the Commander In Chief (CIC). Each CIC has a hand of Command cards and on a turn must play one card from his hand to order units in one section of the EPIC battlefield. Also on the turn, the CIC must select one card from the Courier rack to play. The card selected from the Courier rack will also order units in one section of the EPIC battlefield. There are only three sections in the EPIC battlefield (left, center and right) and with two Command cards played each turn, the action quickly becomes very fast and furious. The Courier rack is a new game mechanic, and starts each battle with five Command cards that are visible to both players. Each turn one card is taken from the rack, so the choice of cards a player has each turn is reduced, until there are only two cards remaining on the rack. The rack is then filled back to five cards before the next player’s turn, and the card selection process from the Courier rack will start again. 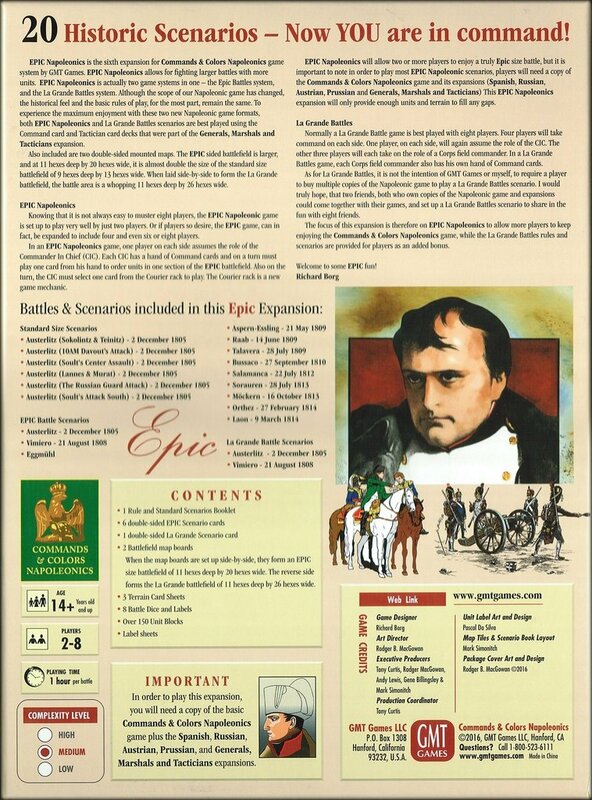 EPIC Napoleonic will allow two or more players to enjoy a truly Epic size battle, but it is important to note in order to play most EPIC Napoleonic scenarios, players will need a copy of the Commands & Colors Napoleonic game and its expansions (Spanish, Russian, Austrian, Prussian and Generals, Marshals and Tacticians) This EPIC Napoleonic expansion will only provide enough units and terrain to fill any gaps. Normally a La Grande Battle game is best played with eight players. Four players will take command on each side. One player, on each side, will again assume the role of the CIC. The other three players will each take on the role of a Corps field commander. Each Corps field commander will command two sections (2 left or 2 center or 2 right) of the six sections that make up the La Grande Battles battlefield. In a La Grande Battles game, each CIC has a hand of Command cards and on a turn must give one card from his hand to one of his Corps commanders. Also on the turn, the CIC must select one card from the Courier rack and give it to one of his Corps commanders. Command cards must be given to the proper Corps commander. Section cards, that state left, must be given to the left Corps commander, center section cards to the center Corps commander and right section cards to the right Corps commander. While tactic Command cards (Command cards with text and no section illustration) can be given to any Corps commanders. In a La Grande Battles game, each Corps field commander also has his own hand of Command cards. During a turn when the Corps commander does not receive a Command card from the CIC, he may choose to play one of his Command cards from his hand. In addition, if the Corps commander does not like the Command card given to him by the CIC, he can discard it and instead play one of the Command cards he has from his hand. Taking a closer look of how a Corps field commander will play a command card. Command cards that are received from his CIC, will order units across both of the two sections the Corps commander player commands. While a Command card that a Corps commander plays from his hand, has some additional restrictions. 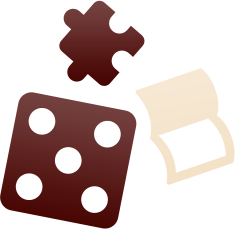 Each Corps commander has two sections under his command. When looking at the two sections, one section is on his left and one section is on the right and he does not have a center. A left section Command card played from the Corps commander’s hand is therefore played in his left section and a right section Command card must be played in his right section. A center section card may be played in either his left or right section and a tactic Command card (Command cards with text and no section illustration) will order units across both of the two sections the Corps commander commands. As for La Grande Battles, it is not the intention of GMT or myself, to require a player to buy multiple copies of the Napoleonic game to play a La Grande Battles scenario. I would truly hope, that two friends, both who own copies of the Napoleonic game and expansions could come together with their games, and set up a La Grande Battles scenario to share in the fun with eight friends. 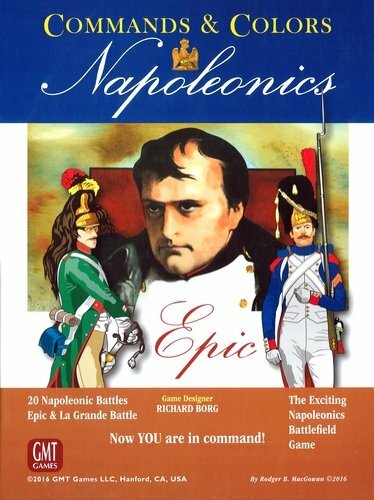 The focus of this expansion is therefore on EPIC Napoleonics to allow more players to keep enjoying the Commands & Colors Napoleonics game, while the La Grande Battles rules and scenarios are provided for players as an extra-added bonus. Welcome to some EPIC fun! In order to play many of the scenarios in this expansion, the basic game or earlier expansions,, you will need a copy of the Commands & Colors Napoleonic game and the Spanish, Russian, Austrian and Prussian expansions. · When the map boards are set up side-by-side, they form an EPIC size battlefield of 11 hexes deep by 20 hexes wide. The reverse side forms the La Grande battlefield of 11 hexes deep by 26 hexes wide.